Our survivor t-shirt will show off that you fought and beat the disease that was holding you back. Get your very own heart ribbon t-shirt to remind yourself that you are so much stronger than you ever thought you were. This survivor heart & ribbon design is printed on our 100% cotton, machine washable t-shirt, available in youth sizes XS-L & adult sizes S-3XL. Free personalization of any name is included. A quality T-shirt that washes well. My daughter was very happy with the personalization. Additional Info MyWalkGear.com has a variety of awareness t-shirts to help you show your support for the causes that are most important to you. Any cancer survivor that you know and love would appreciate our heart ribbon t-shirt as a celebration that they have combat their disease. 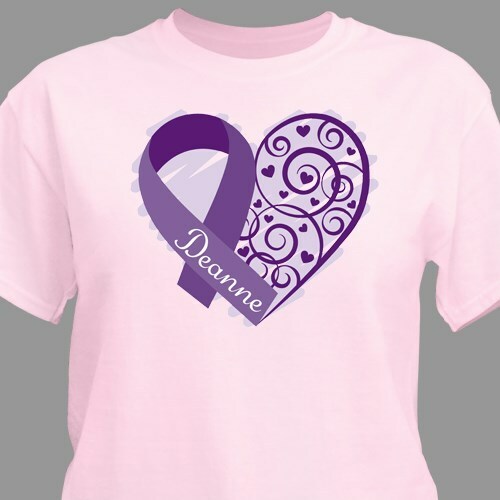 Our Breast Cancer Survivor T-Shirt is another great t-shirt that will show your strength.